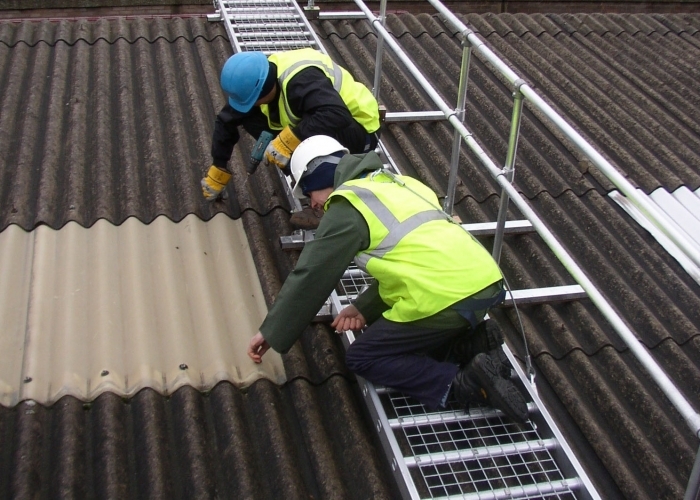 The Easi-Dec Industrial Roof Access range has been designed for use on fragile materials to provide users with a safe, portable, easy to assemble working platform. Board-Walk - a portable open mesh walkway which provides access from the eaves to ridge by spreading the weight across the support battens. Valley-Walk - a lightweight portable frame with mesh side panels which allows the user to move freely along valleys, northern lights and box gutter details on fragile roofs. Roof-Walk - a fully guarded rolling work platform mounted onto twin tracks which enables workers to move safely up and down the roof.